Guliyev overcomes a slow start and edges past the favored Wayde van Niekerk. LONDON — It wasn’t Wayde van Niekerk and it wasn’t Isaac Makwala. Instead, Ramil Guliyev of Turkey earned the upset of the world championships Thursday when he matched Van Niekerk stride for stride and won the 200-meter title by lunging at the line just ahead of the favored South African. Jereem Richards of Trinidad and Tobago took bronze, while Makwala faded down the stretch and finished sixth. The 27-year-old Guliyev, a little-known sprinter who transferred nationality from Azerbaijan six years ago, was not even among the top 10 performers this year before stunning his rivals and the sellout crowd of 60,000 at the Olympic Stadium. Guliyev finished in 20.09 seconds, .02 seconds ahead of both Van Niekerk and Richards. The South African took silver by .001 seconds. 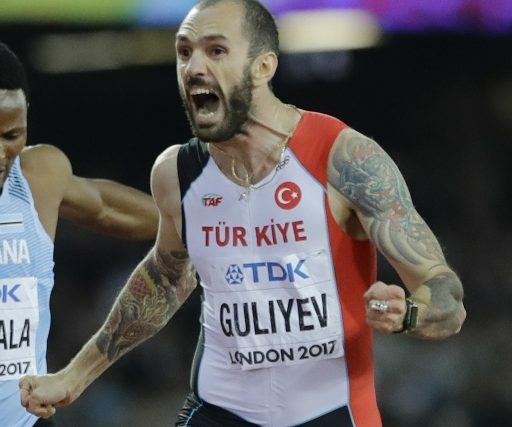 Guliyev held his hands over his mouth in sheer disbelief after the slow race – the slowest final since 2003. “This is not a shock but this does not feel real,” said Guliyev, whose best performance coming into the worlds was a silver medal at the European championships last year. Van Niekerk can only be disappointed with gold and silver. He fell just short of getting the first 200-400 double at the world championships since Michael Johnson in 1995. “Coming away with two medals – both a good color, gold and silver. I think it’s great for my career,” the 400-meter Olympic and world champion said. In the first 200-meter final without Usain Bolt since 2009, it was wide open from the start. Guliyev had the second-slowest start of the eight finalists but quickly surged among the leaders. Van Niekerk was slightly ahead coming off the bend but Guliyev stuck with him all the way. Makwala, at the end of the saga that started with a stomach virus early in the week followed by a forced quarantine and belated entry in the 200 heats, failed to sustain the early pace and quickly fell out of contention. As shocking as the 200 turned out to be, the triple jump was predictable – another great fight between American teammates Christian Taylor and Will Claye. As usual, Taylor came out on top. The two-time Olympic champion won with a leap of 17.68 meters. Claye, the runner-up behind Taylor at the last two Olympics, was 5 centimeters behind for silver. On another good day for the U.S. team, the Americans also got a 1-2 finish in the women’s 400 hurdles. Running in the outside lane, Kori Carter picked up speed after 100 meters and never wavered, winning in 53.07 seconds. That was .43 seconds ahead of Dalilah Muhammad. With three days to go, the United States has 19 medals overall. Kenya is second with seven.